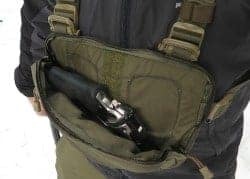 Alternatives to the traditional Bug Out Bag (BOB) and the Every Day Carry (EDC) bag may be a viable option for many preppers and survivalists. Though the purpose of these two standard type supply bags can be quite different, they do not have to be exclusive. Different kit bags can be tasked for different conditions, situations, or circumstances.Another such kit bag to consider has the main and sole purpose for expedient self-defense and very short term survival. This bag or kit could be stored hidden in a vehicle, locked in a bottom drawer, file cabinet or desk at work along with the bottle of brandy, or added as a supplemental kit to a brief case, satchel, or backpack used in everyday travel or carry. It could be carried alongside the diapers in a stroller, in the zippered ball bag as part of a golf bag or tennis gear bag. It could be in a gym bag as part of your workout gear or exercise facility equipment. The general idea is to have it available when or if it is needed. The EDC Gun Kit can go anywhere, be anywhere that there is a reasonable expectation that a threat could exist or develop. This implies situations outside of the house or primary residence. There you should already be protected with self-defense weapons, ammo, and supplies. Outside your home or at work this may not usually be the case, hence the need for such a specialized kit bag. 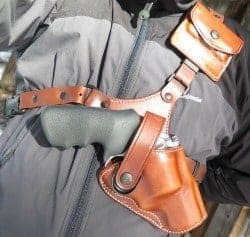 Sure, it would be just as simple to carry a concealed weapon on your person as have to worry or keep up with another bag to grab. Well, maybe. Concealed carry is not always the best option or even a legal one in some circumstances. Besides, in this case, we are talking about more than just having a handgun hidden in the small of your back, or inside the waistband. CCW often just implies a single occurrence. A threat appears, defend yourself, and move on to safety. Such as a parking garage mugging attack or assault. That is obviously oversimplified, but after your pistol mag is empty, what then? The EDC Gun Kit is intended for providing safety for a relatively short period of time. Such as, getting down the street to your parked car, or out of a park or zoo, or shopping center, or around the block to a police station or other secure area. It might also become a circumstance where you are forced to hunker down overnight until the run rises so you can move on. Under these conditions, you are going to want a little more gear and supplies than a gun in the pocket, but perhaps not as much as you might have put together in a full bore survival every day carry bag with food, fire, and sheltering provisions. This becomes a fine line of course, between one kind of supply bag or kit and another one. Those choices are yours, but it is worth considering to have options and to create other kits for other uses or even multiples of them for caching at different locations, different vehicles, or other secure places. This bag should be small, light, but highly durable. It can be a carry bag with handles, a satchel with shoulder strap, a sling bag, fanny pack, or downsized backpack. 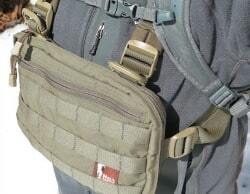 It needs to have multiple pockets with secure closures and loops for attaching things or loops to latch onto. It could have Molle loops as well. A bag that is waterproof or at least water resistant is best. There are some larger pistol or gun cases, range bags, or tactical type bags that might do. Military map cases, computer bags, attaché cases, or tactical shoulder bags can work too if that are not too large or present too obvious a profile. 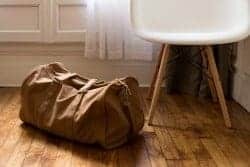 Roller bags, or wheeled cases, or even small luggage type bags are too big for this job and too cumbersome to move quickly and travel fast. Stay with a low(er) profile styling and a black or blend in color like an earth tone. Stay away from anything designer type that might attract unwanted attention. Case in point, during a trip to Costa Rica one of our party was attacked and robbed on a main street in town while carrying a pink backpack with a Disney character on it that screamed “Hey, I am an American tourist”. I advised her to ditch it on day one, but she paid the price for not listening by losing her passport, credit cards, IDs and cash money. Leave the statement patches off the hook and loop stickers. Don’t snap lock on name tags or political do-dads or anything trying to make a statement. Your statement is to go unnoticed in a crowd, in the office, or walking down the street. Just another average Joe or Jane on a stroll or trying to get home. What should go in this every day carry or stash bag? We call it a “gun kit” so naturally the primary item for this bag is a self-defense or offensive weapon. In theory of course, it could be any handgun for which the user is comfortable and proficient in using. This means a revolver or semi-auto. Pick one that works for you, but choose a firearm that has enough power to handle potential confrontational situations. My opinion, but for this gun kit, get at least a .38 Special, .357 Magnum or maybe a .44 Special in a revolver. 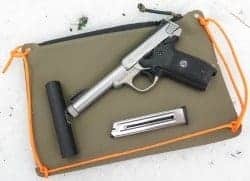 For a semi-auto pistol choose the 9mm at the very least. If you can handle a bigger gun such as a .45 ACP then choose that. However, don’t go overboard. You don’t need a Desert Eagle in .44 Magnum. Your EDC kit gun should be as small and portable as possible. Reloading is a consideration, too. For revolvers you can keep a couple of extra speed loaders that holds five or six extra rounds in a quick release device. Just insert the 5-6 held cartridges into the revolver cylinder after ejecting the fired cases, and quick turn the speed loader release. This reloads the entire 5-6 round cylinder all in one motion. Likewise, consider keeping at least 2-6 extra loaded magazines for your gun kit pistol in the bag. There are no “usual or normal” circumstances that one may encounter during a SHTF, but hopefully 30-50 rounds should be enough to get you out of trouble and safely away from any threat or problem scene. Some of the bag types mentioned above will have pistol magazine holding loops ideally inside the bag out of public view. Practice withdrawing them to reload and practice those motions, too. You got the gun covered. Now what else? The list could be endless or personalized to your concerns, but keep it limited to bare essentials. Remember the gun kit can be altered, modified or changed out as use over time yields new experiences or input. The gun kit needs to be kept light and handy. Again it is not a full bore EDC bag. So, maybe add a knife, flashlight, light gripper gloves, and maybe a full day of meds that you may have to have for health reasons. Perhaps there is room for a single bottle of water and a nab or two. Try to think of keeping this bag under ten pounds total. Personal customization is the key to your use and reliance upon such a gun kit bag. You may want to add a cigarette lighter, or box of matches. Your cell phone may be in this bag or a secondary backup phone. What else would you add, while maintaining the restrictions? There is no rocket science in building an EDC Gun Kit. Just realize its narrow function in terms of short term defense and very basic survival for not much longer than over one night at the most. It is only designed to protect and sustain you long enough to get you out of a building, store, or any such location in order to reach your vehicle or to then drive to another safe place or home. Again, considering adding another prepper-survival bag might sound like overkill and it may be for some. However, this is just an option to consider. Only you can ultimately decide what bag, weapon, gear, supplies, and self-defense posture you want to take. Just don’t get caught without something to rely on when SHTF happens.